With its seaside charm, beach culture, blue waters and lush green coastline, the island of Maui is a vacationer's paradise. Yet for some, it is also a place to call home. An island known for its diversity and tolerance as much as it is for its island culture and laid back way of life, Maui draws many vacationers who decide to become permanent residents. Homes for sale in Maui, Hawaii, allow those who are making this transition to find a property that embraces everything they love about the island. 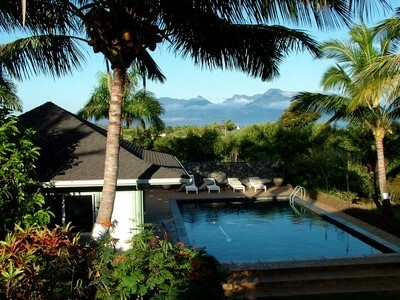 Maui real estate for sale is as diverse as the population of the island itself. Those shopping for Maui homes for sale will find a vast number of properties available in sizes and with prices to fit most needs and budgets. While many often consider condos as the main property type in Maui, the island has a number of subdivisions with single-family homes. Away from the coast, and even occasionally on it, buyers will find single-family homes in established and new communities offering spacious floor plans, yards and even private garages. In addition to a variety of home types, Maui has a variety of regions that buyers must consider when making the move. Some find the rural, artistic community of Upcountry Maui to be appealing while others prefer the wilder, untouched land along East Maui. West Maui is known for its white sand beaches and the Ka'anapali resort areas, while Wailea with its golf courses and resorts in South Maui appeals to others who are looking for the beachfront lifestyle. In the center of the island, newer developments are popping up around established communities to provide additional Maui homes for sale. An increase in prices is just one indicator of the health of a real estate market. Homes for sale in Maui, have also seen a decrease in the average number of days they sit on the market. With increasing prices and lower average days on market, the Maui real estate market is one that is working well for sellers, although buyers will find a range of properties makes it a great market for them as well. Whether buying or selling, those involved in the market will find that while the average days on market may be longer than the national average, well priced real estate moves very quickly. Wise sellers price to generate immediate interest and not chase the market. Wise buyers must sometimes play a game of patience, waiting for those deals to hit the market or for the opportunity to move on a property long on the market but ready to sell. Maui Homes is proud to present the best that Maui has to offer. Fred Haywood Realty is one of Maui's most trusted and long established realtors, not to mention an island born and raised olympic medalist. Call or email us to set up a time to meet in person to discuss your next dream home.